October 3, 2018 at 2:42 pm EDT | by Lou Chibbaro Jr.
Three Delaware libraries are displaying Gay History Month materials. 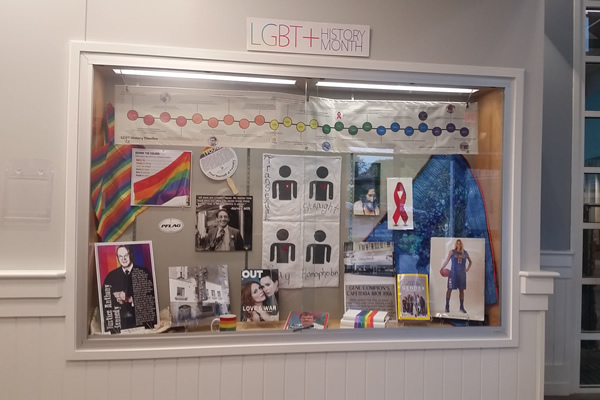 The Rehoboth Beach, Del., chapter of PFLAG, the national organization representing parents and friends of LGBT people, has provided three Rehoboth area public libraries with special LGBT exhibits for the month of October to commemorate Gay History Month. Linda Gregory, Rehoboth PFLAG’s president, said arrangements were made to install the display case exhibits at the public libraries in Rehoboth and the nearby Delaware cities of Lewes and Georgetown. Rehoboth PFLAG member Chris Spicer said the exhibits in each of the three libraries consist, among other things, of photos and posters of LGBT people of historic significance, such as San Francisco gay rights pioneer Harvey Milk. She said the displays also include a colorful timeline chart that shows major events and milestones in the effort to advance LGBT rights.